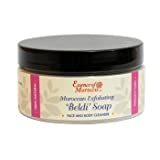 Moroccan Beldi Soap / Savon Noir is a traditional natural Exfoliating Olive Oil soap with Eucalyptus Essential Oil, quintessential to the Moroccan Hammam ritual. Traditionally used with a Kessa Glove to enable deep cleansing of the skin by removing dead skin cells and eliminating toxins. Helps leave skin soft and rejuvenated. Apply Essence of Morocco Organic Nourishing Argan Oil to moisturise and nourish skin. Traditional Natural Exfoliating Olive Oil soap. Traditionally used with a Kessa Glove to enable deep cleansing of the skin by removing dead skin cells and eliminating toxins. Helps leave skin soft and rejuvenated. Apply Essence of Morocco Organic Nourishing Argan Oil to moisturise and nourish skin. This entry was posted in Organic Health Products and tagged 200g, Beldi, Exfoliating, Natural, Pure, Soap by Organic Health. Bookmark the permalink.